During the 20th century, Argentina was a crucible generating transnational identities. It received more European migrants than any other country in Latin-America and was second only to the USA in terms of absolute numbers of European arrivals. More than two-thirds of these migrants were Italians and Spaniards. By going into exile in Argentina, Italian and Spanish migrants fled from war or intended to avoid prosecution under the fascist regimes led by Mussolini (1922-1943) and Franco (1936-1975). However, the host country itself went through a time of political turmoil between the pivotal years 1930 and 1976. In 1945, Perón, an admirer of Franco and Mussolini, and his wife Evita, a great defender of women’s rights, broke the power of the military that had ruled Argentina from 1930. A new military coup overthrew Isabel Martínez de Perón’s government in 1976, two years after Perón’s death. 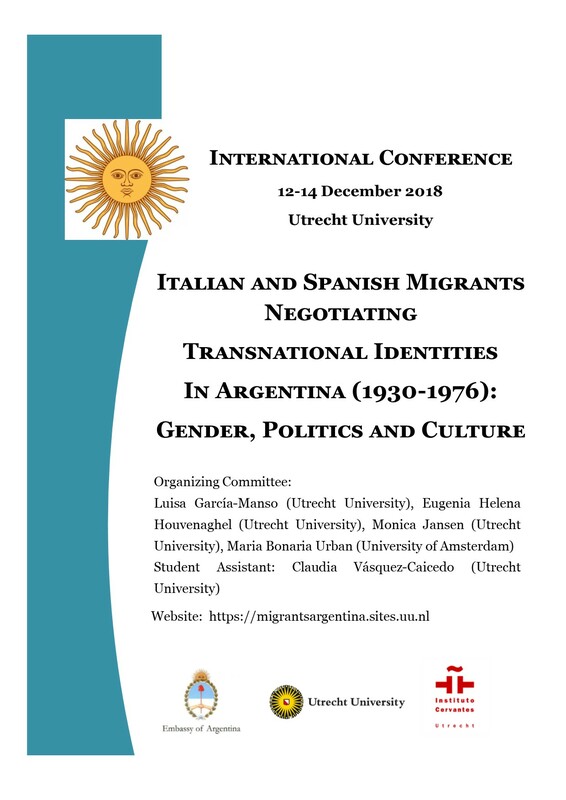 The International Conference, hosted in the beautiful city of Utrecht, invites scholars of different disciplines of the Human and Social Sciences to shed light on the vital trajectories and the artistic, political and scientific contribution of Italian and Spanish migrants to the Argentinean society and culture between 1930 and 1976. In particular, the International Conference is interested in exploring the following questions: How did the Italian and Spanish migrants, who brought along their own experiences of resistance and citizenship from their home countries, contribute to the Argentinean society and culture? By means of which strategies did these migrants negotiate new transnational identities in their host country where different political and cultural movements contested the regime and protested against the exclusion of women from the public sphere? The aims of the international conference are: (1) to determine the impact of gender on Spanish and Italian migration and exile in Argentina; (2) to reveal the participation of Italian and Spanish migrants in the Argentinean host society; (3) to analyze the impact of transnational experiences of war, fascism, resistance, and citizenship in cultural and intellectual productions; (4) to study and compare the role played by Italian and Spanish migrants in the Argentinean cultural sphere; (5) to bring together two different groups of researchers (specialists on Italian and Spanish migration) and sow the seeds of new joint projects on the Italian and Spanish migration to France or Cuba. Manuel Aznar Soler (Universitat Autònoma de Barcelona), Federica Bertagna (Università degli Studi di Verona), Reindert Dhondt (Universiteit Utrecht), Luisa García-Manso (Universiteit Utrecht), Eugenia Helena Houvenaghel (Universiteit Utrecht), Monica Jansen (Universiteit Utrecht), José Ramón López García (Universidad Autònoma de Barcelona), Pilar Nieva-de la Paz (Centro de Ciencias Humanas y Sociales, CSIC), Alejandro Patat (Università per Stranieri di Siena), Emilia Perassi (Università Statale di Milano), Loredana Polezzi (Cardiff University), Maria Bonaria Urban (Universiteit van Amsterdam), Francisca Vilches-de Frutos (Centro de Ciencias Humanas y Sociales, CSIC).